No alcohol was allowed to be served anywhere on Good Friday, at least in Dublin and most likely everywhere else in Ireland. You were not allowed to acquire alcohol ANYWHERE. No pub, club, convenience store, grocery store, or anything sold alcohol on Good Friday. It was kind of odd or, at least, interesting. Starting 12am Friday to 12am Saturday, no alcohol was sold. So you could go to a pub and drink on Thursday up to 12am and then you could finish the second half of the night Friday(Saturday) after 12am. 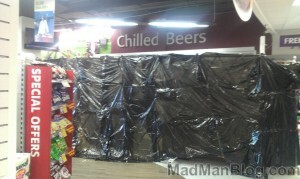 This caused a mini-run on the alcohol stores the day before. When you went into the stores on Thursday, the shelves of vodka, gin, rum, and cheap beer were all empty. It was a case of people stocking up on alcohol the day before Ireland went dry. I thought this was such an interesting occurrence that I just had to share it with you :).